Tag line: "All the Screen's Titans of Terror - Together in the Greatest of All SCREEN SENSATIONS!" 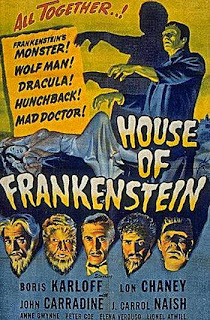 Despite its title, House of Frankenstein gives us more than one Universal monster. In fact, it features an all-star cast in what is essentially the very first monster mash-up. From there, Niemann and Daniel, accompanied by a pretty gypsy girl named Ilonka (Elena Verdugo), head to the abandoned castle of Dr. Frankenstein, where Niemann hopes to recover Frankenstein’s research notes. Once there, they find both the Wolf Man (Lon Chaney Jr.) and Frankenstein’s Monster (Glenn Strange) frozen in ice (harkening back to the conclusion of Frankenstein Meets the Wolf Man). Once he's thawed out, the Wolf Man returns to human form, reassuming the identity of Lawrence Talbot. Niemann tells Talbot he can remove the curse that causes him to transform when the moon is full, all while trying to revive the monster so it can continue the hunt for those who did Niemann wrong. Marking Karloff’s return to the Frankenstein series (albeit as a mad scientist), House of Frankenstein also features an excellent turn by John Carradine as Dracula (the look on his face when he surprises the Bürgermeister one evening will send chills down your spine). Chaney Jr. is his reliable self as Talbot / the Wolf Man, and Karloff steps into the role of the mad scientist quite nicely. There’s even a brief appearance by Lionel Atwill as a police inspector. The truly stand-out performance, though, is delivered by J. Carrol Naish, whose Daniel falls in love with Ilonka, only to be cast aside when she develops feeling for Talbot. 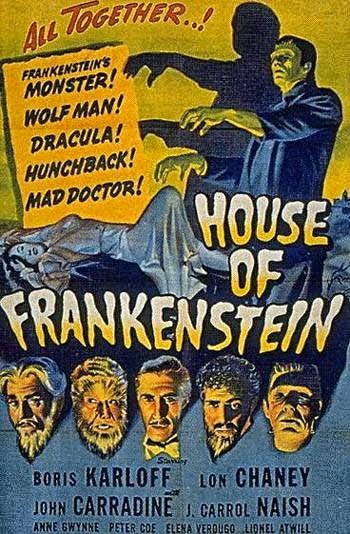 Story-wise, The House of Frankenstein doesn’t make a lot of sense, and gets a little confusing at times (I completely lost track of which brain was going to be transplanted into which body). But if it’s classic monsters you want, look no further than this film.